Uses a “smart” motor that “senses” when the patient needs “powered” assistance to successfully complete upper and lower extremity exercises. Help patients with limited function perform therapeutic exercise. 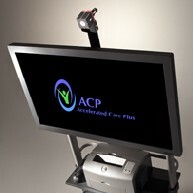 Accommodates patients with paralysis or mobility challenges. Provides effective neuro, ortho and cardio therapy. Engages and motivates patients with “biofeedback” that guides their exercise performance for improved outcomes. May assist in treating symptoms associated with: Stroke Recovery, Neuromuscular re-education, Parkinson’s, Multiple Sclerosis, Joint Replacement and other Orthopedic Conditions, Arthritis, COPD. Introduces gentle electrical stimulation to the body through electrode pads. Stimulates the normal firing patter of nerves/muscles. May assist in treating symptoms associated with: Neuromuscular re-education, Parkinson’s, Multiple Sclerosis, Stroke Recovery, Joint Replacement, Bladder Control.